Badland is by far one of the best atmospheric games I’ve played recently – addictive, visually beautiful, not too difficult, yet challenging. 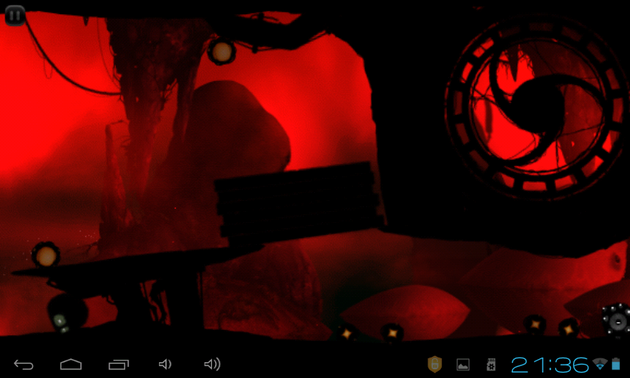 Everything about Badland deserves a standalone paragraph, but let’s get to the core. Your character is a little fluffy creature making its way through a dark sinister forest full of really scary things – scissors, shredders, bombs, giant needles and all sorts of sharp and cutting weapons that want to cut your little pet bird in tiny feathers. I say bird, but I really don’t know what kind of animal that is. Some say they’re owls, others think they’re bats, but my guess is they are neither. The animal is just a black fluffy ball with tiny disproportionate wings and big sad eyes. The creature is obviously scared, but nonetheless it is incredibly brave and strong. At some point, it will stumble upon power ups and multiply itself into a group, or a colony, so traveling through the maze is not as scary as when the thing is all alone. The controls are simple – you just tap the right side of the screen to set the bird on motion, and as long as you hold the button, it flies. Once you let go, it glides down and rolls if the surface allows rolling. Otherwise, the bird gets either stuck, or shredded, or cut into pieces. The game offers both single- (90 levels) and multiplayer (23) modes for up to 4 players on the same device, and even though I haven’t tried the multiplayer mode, I can barely imagine 4 people playing the game on the same device – not because I doubt the functionality, but because the game makes you highly emotional on the failures. It gives you a rush of adrenaline, so stay away from Red Bull and coffee if you want to save your heart rate. 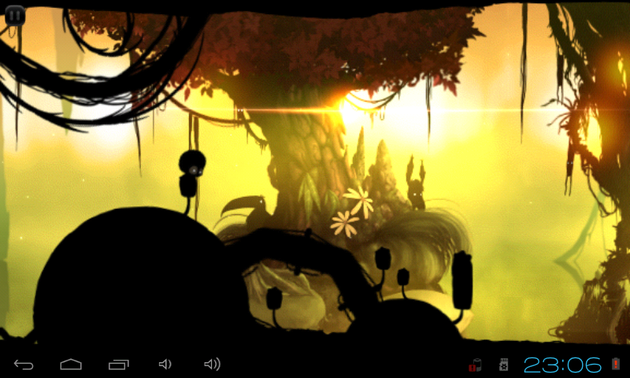 Badland supports cloud save, and is a fit for both smartphones and tablets. Now, the graphics are not just beautiful, they are gorgeous despite the fact that half the things in the game are plain silhouettes, which only adds to the engrossing atmospheric effect. The forest is lush and full of trees, flowers and creatures, but it is utterly deadly, and it adds a sort of a Silent Hill creepy beauty to the environment. Even though visual performance is not Badland’s only virtue, it sure is one of the reasons to play, complementing the highly addictive and challenging gameplay. 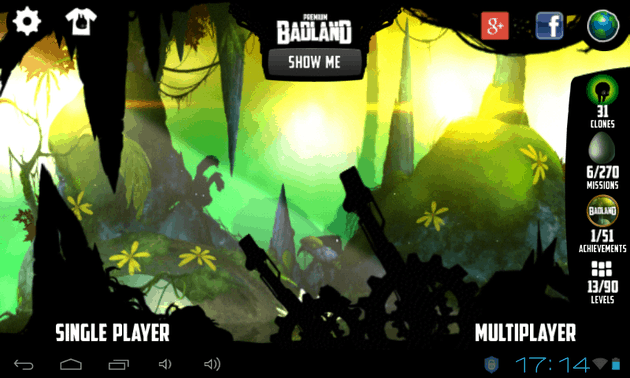 From the moment you launch the game, until the moment you start perspiring as the game becomes more challenging, Badland keeps you tense and focused – is that not the sign of a highly engrossing game? 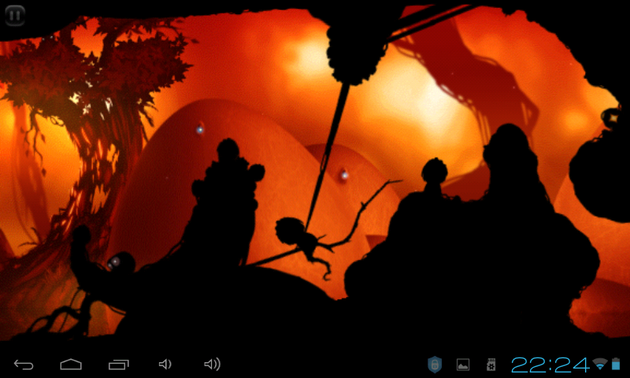 Badland is a great example of ingenious simplicity – the plot is minimal, the graphics are half-silhouettes, but the game is a unique experience and a real treat. I couldn’t find a flaw with it, no matter how hard I tried. The soundtrack could otherwise be a sort of a meditation loop – mysterious and deep, a perfect background for the beautiful maze. However, instead of soothing you to focus, the music only adds to the atmosphere of fear and panic, so yet another great score for the developers here. There are a few upgrade to the premium offers, but you can skip and play just as fine. Occasionally, especially when the levels get difficult, you stumble upon power ups that make your creature bigger or smaller, depending on circumstances. The best power up is when the creature unlocks its own friends, and they travel together, although this is also the hardest part because very often you have to sacrifice large groups of your friends to be able to make it to the next checkpoint. Some levels are hectic and filled with checkpoints, while others are slow and utterly evil, with blood chilling traps and obstacles. 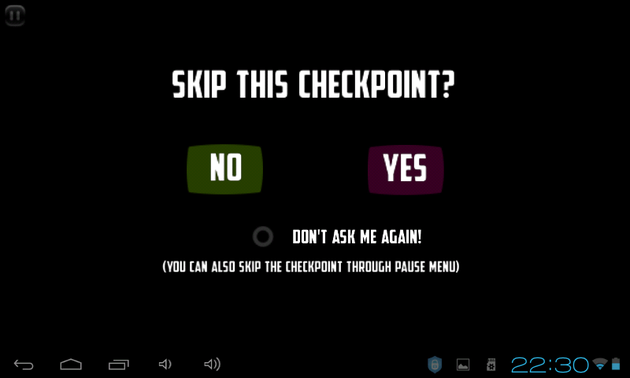 At some point I faced the checkpoint I couldn’t work my way around, and I started feeling desperate, when a pop-up window suggested we skip the checkpoint. Yes, please! So, whenever you face a dead end, and fail I don’t know how many times in a row, Badland will generously offer a magic wand workaround. Scary, yet gorgeous settings, and considering the foreground is nothing but silhouettes, it beats me how the environment is so immersing and the creature has so much personality. The art work, mystifying soundtrack and momentum give the fluffy creature a unique personality you can’t help but relate to as you play. The traps and obstacles are very creative, not too difficult, but mostly lethal. IAPs are not intrusive. It is possible to beat the game without buying in. Power up are always timely while the levels are designed cleverly, where your creature or creatures work like falling dominoes, triggering the sadistic traps. In most cases, you play by trial and error, so you watch your bird die numerous times while you find your way through the maze. Having to sacrifice your own kind for the sake of victory is a hard call, even more sadistic than the traps. 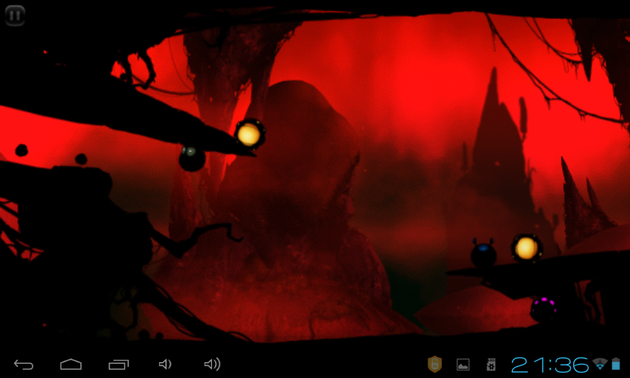 A great atmospheric side scroller, Badland is the best in its genre – visually gorgeous, intense, scary and emotional. The game is a cool blend of great physics, mystic soundtrack, smooth animation and a unique artistic touch to it. The difficulty increases as you progress, but the game offers power ups and even a skip checkpoint option for the desperate cases, so you’ll never be aggravated when things get tough. 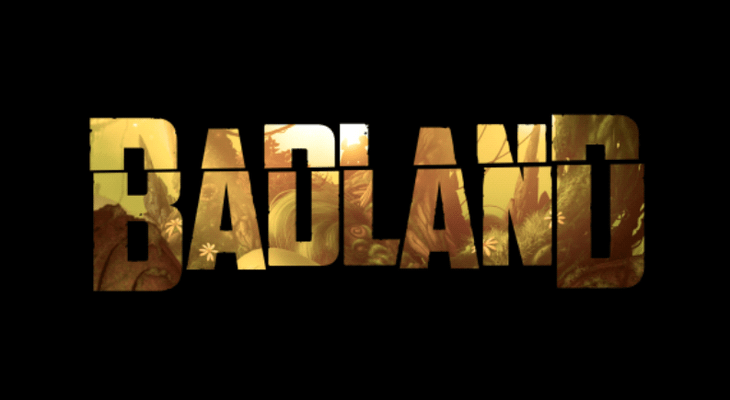 Badland is a very addictive and entertaining game, somewhat reminding of a Machinarium and Flappy Bird, but the complexity and simplicity is a rare combination in a mobile game, let alone free one. It’s immersing, consistently intense and challenging, yet simple and non-repetitive. We give it a full 5 star rating without a shadow of a doubt. Not a paid advertisement, seriously.